Late January is a favourite time of year for us here at Showbie, because it’s when we get to travel to London to attend BETT, one of the biggest education technology trade shows worldwide. It’s a great opportunity for us to talk directly to Showbie teachers and administrators, helping us understand how to make Showbie work even better at your schools. We’re still buzzing! To cap it all off, we’re also releasing Showbie 3.2, which includes many new features and enhancements. Read on for the details. 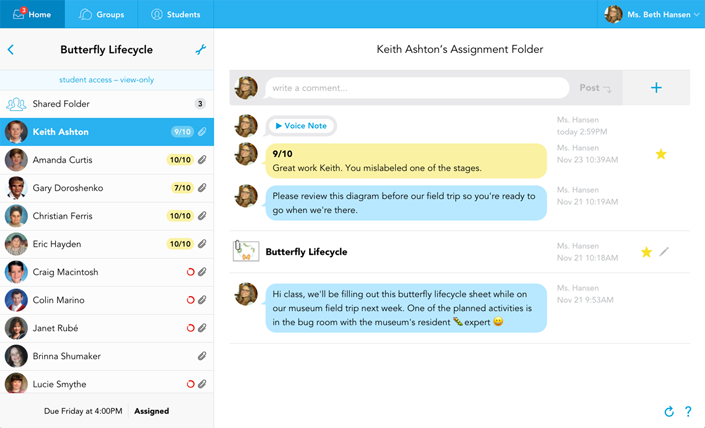 Teachers have long appreciated the simplicity of Showbie assignments. Previously, they could be set to have a due date, or not, and could be locked or unlocked. That’s it. Those two features have provided a surprising level of versatility, whether you’re using Showbie for term-long projects, weekly assignments, or in-class activities. In Showbie 3.2, we’ve added two more simple features that will make assignments even more useful and versatile. In addition to being either locked or unlocked, Showbie assignments can now be set to ‘view-only’ mode. When you set an assignment to be view-only, your students will be able to view their work, along with your feedback and grades; however, they won’t be able to make any changes. 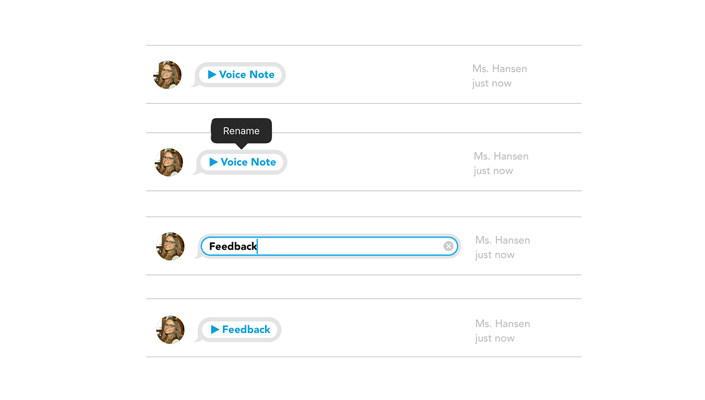 With view-only mode, you can easily return final marks and feedback to your students, without worrying about unwanted revisions. Create a locked assignment and schedule it to become editable in the future. Your students won’t see the assignment in their assignment list until it becomes unlocked for the first time. You could do this to prepare assignments in advance, or set work to be completed when you’re going to be away from your class. Schedule an assignment to lock at, or shortly after, the due date. This will create a strict deadline and prevent students from submitting late work or revisions. Grade and provide feedback on locked assignments in a number of classes, and schedule them to become view-only at the beginning of the next week, so all your students receive grades and feedback simultaneously. Schedule an assignment to unlock at the beginning of class, and lock at the end of the class, to deliver a timed quiz through Showbie. Showbie sends different notifications to keep you in the loop in your classes, assignments, and groups. In Showbie 3.2, you can now tailor these notifications exactly to your liking, in much more detail than was previously available. You can even choose whether you want to receive individual notices by email, iOS push notification, or both! Finally, one of our most frequently requested new features is now available! Simply tap and hold on a voice note to change the name to something more descriptive. This is currently available for voice notes in folders on the iOS app, but will be available shortly for pinned in-document voice notes, and on the web app as well. Please note that we’ve also changed the way files are renamed. Rather than swiping right-to-left on the document, you must now tap and hold the document name to edit it. GarageBand is one of the great iPad apps, but until now, its ability to work with Showbie has been limited due to the unusual way it exports project files. We’ve sorted this out in Showbie 3.2, so you can now freely export either audio files or project files from GarageBand to Showbie. Additionally, audio files saved from GarageBand to Showbie can now be re-exported from Showbie into other apps. Rock on! We’ve updated the web app with a beautiful new navigation bar. The refreshed design will make it easier for you to get where you’re going in Showbie, and works much better on a variety of screen sizes and mobile devices. Just as in the iOS app, realtime updates will stream automatically into the Showbie web app when you’re viewing a group or a class discussion. Let the conversation flow! I’d like to say a big thank you to all you teachers, students, and administrators for keeping us inspired with your enthusiasm and ideas. Keep up the good work and stay tuned for more updates coming soon! See Showbie in Action at Bett and Enter to Win an iPad Pro!